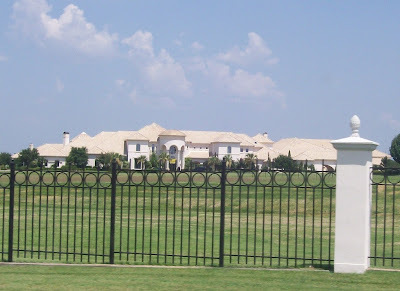 A look at Texas Mansions ! This is the massive mansion of former NFL player Deion Sanders. It is located in Prosper, TX. 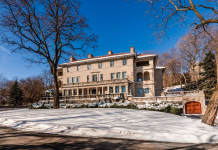 This house was the main backdrop for his reality show Deion & Pilar: Prime time Love. 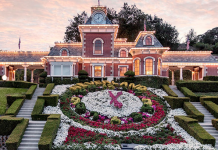 The 40,000 square foot, 30 room mansion contains a grand foyer with double staircase, 9 bedrooms, 14 bathrooms, a large master suite with 2-story closet, a home theater, a gym, indoor and outdoor pools, full sized basketball court, a bowling alley, a game room, and large garage. 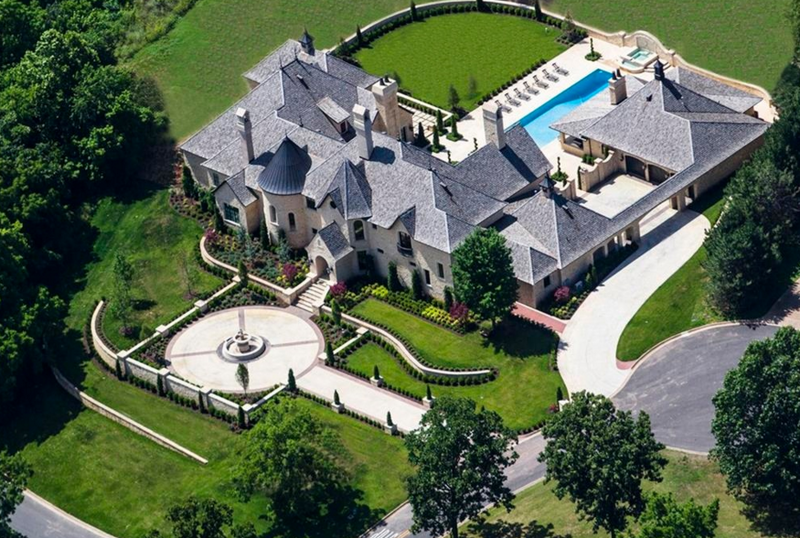 This weird shaped mansion is located at 5504 Hamptondale Road in Plano, TX. 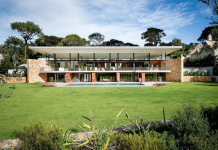 The 12,103 square foot house contains 7 bedrooms and 7.5 bathrooms. This beautiful mansion is located on a large corner lot and contains a swimming pool with spa, a tennis court, and a large attached garage. 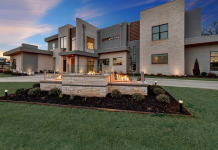 The homes is located at 6401 Indian Trail in Plano, TX. 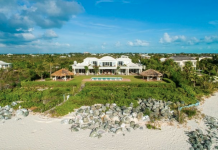 It has 13,199 square feet with 6 bedrooms and 10 bathrooms. The owner of the home is Dr. Jude E. Ndudi Sr. These mansions are located on Palm Royale Blvd in the Sweetwater Country Club. 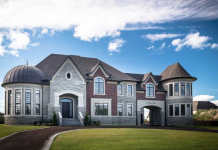 These homes are very grand and come complete with gated entrances, swimming pools, fountains, and tennis courts. This country club has some of the largest and nicest homes in the Houston area. This mediterranean style mansion is located on Palm Royale Blvd in the Sweetwater Country Club. The gated estate comes with a swimming pool and pool house. These 3 large mansions are located on Grand Manor in the Sweetwater County Club. The house on the far right is over 35,000 square feet! 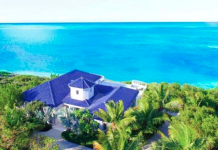 It is owned by NBA superstar Tracy McGrady. 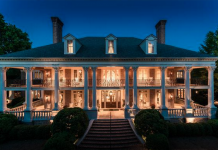 This mansion is located on Beacon Hill Drive in the Sweetwater Country Club. This mediterranean style mansion is located at 3712 Dustin Trail in Arlington, TX. 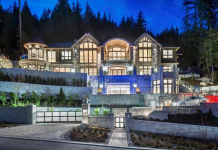 It has 13,094 square feet with 5 bedrooms and 5 bathrooms. 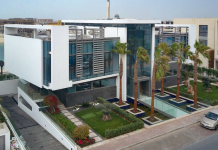 It also has a swimming pool and a large detached garage. The home is valued at $3,365,500. 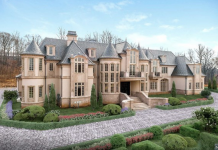 This mansion is being built at 5530 North 40 Place in Dallas, TX. 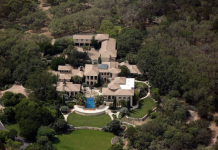 The 14,628 square foot mansion has 6 bedrooms and 11 bathrooms.